At a time when classical music is eagerly, anxiously, even desperately trying to connect with a younger generation, he is one of the rare composers who is at once popular, hip, and active at the large classical-music institutions that are having the hardest time winning young audiences. 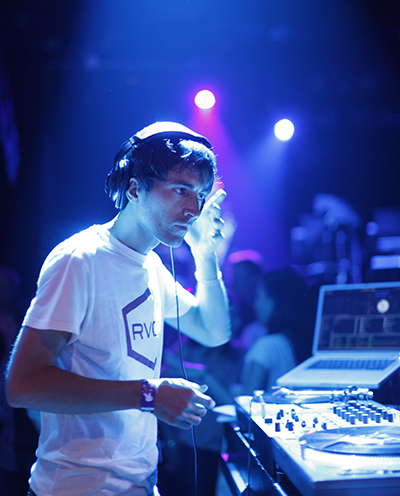 Mason Bates DJing at Mercury Soul at San Francisco’s Mezzanine Club in 2009. Mason Bates, Musical America’s 2018 Composer of the Year, is carrying a lot on his shoulders. 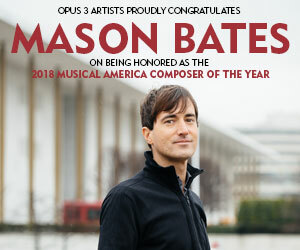 At a time when classical music is eagerly, anxiously, even desperately trying to connect with a younger generation, Bates is one of the rare composers who is at once popular, hip, and active at the large classical-music institutions—opera houses and orchestras—that are having the hardest time winning young audiences. This year, Bates’s first opera, The (R)evolution of Steve Jobs, had its premiere at the Santa Fe Opera. The response was overwhelmingly positive: standing ovations, sold-out houses, and generally favorable reviews—with a couple of negative ones only adding to the implicit sense of rebellion inherent in a 90-minute, one-act opera about the founder of Apple computers. The strongest part of the evening was Bates’s vital, nuanced score, mixing in his signature electronics, amplifying the voices (but not too much), and refraining from bogging down too often in the intoxication of creating something on such a large scale. “You don’t want to fall into the trap of writing a symphony with parlando grafted onto it,” he said to me, some months before the premiere. And he didn’t. “It was the only opera I’ve ever really related to, not just enjoyed. It changed my experience of what opera can be,” wrote one fan, according to the Santa Fe Opera’s Twitter account. Bates, 40, is one of the most-performed living American composers—precisely because he gives people something to like. Orchestra audiences who aren’t sure about contemporary music hear thoughtful, skillfully written pieces that are at home in the modern world and offer the ear a lot to hold onto. There are electronics—Bates himself, at his laptop, often sits among the orchestra players. There is amplification. There is a propulsive, kinetic energy. There are mercurial transformations from one thing to another. On the one hand, you have eye-catching elements like the percussion section played on used car parts in Alternative Energy, a four-part symphony that follows the development of modern technology from Henry Ford tinkering in a junkyard to a future in which the last members of humanity live in an Icelandic rain forest. On the other, you have passages like the solo violin line in the “Sirens” movement of the Anthology of Fantastic Zoology, based on a bestiary by Jorge Luis Borges, which Bates wrote for the Chicago Symphony Orchestra: an unabashed moment of sheer beauty. One reason Bates is able to reach audiences, according to the conventional wisdom, is what one might call his dual musical citizenship: In addition to being a classical composer, he has DJed under the name DJ Masonic. Yet at a time when the Brooklyn musical scene is rife with alt-classical composer-performers playing their own work in small, rock-band-like ensembles, Bates seems almost square for the company he keeps: active with groups like the CSO, where he was composer-in-residence for five years, or the San Francisco Symphony, which presented a festival called “Beethoven and Bates.” He’s currently the first-ever composer-in-residence at the Kennedy Center, serving as a visible representative of youth and new music at an institution which hasn’t ever been particularly known for either. Also attractive to orchestras is Bates’s involvement with that most popular of buzzwords, outreach. He doesn’t call it that. But given that orchestras hope to find ways of programming new music that will attract new audiences, and that Bates and Clyne did that through curating the CSO’s new-music series during their residency there, it’s small wonder that programming has become a significant part of his portfolio. At the Kennedy Center, Bates almost single-handedly carries classical new-music programming with the series “KC Jukebox,” which mingles voices from across the musical spectrum—from the male vocal group Chanticleer to the hiphop/electronic collaborative Thievery Corporation to musicians of the National Symphony Orchestra. “Programming shouldn’t be just four or five post-minimalist dudes from the same borough,” he once told me. Given the tremendous demands of his Kennedy Center residency—where his initial three-year term was recently extended for two more years, through July 2020—it’s striking that he’s been able to keep up a steady stream of new work. “You have to be very disciplined about scheduling,” he said in a recent conversation. “For me one of the nice things [is], my composing needs kind of align with my family needs. I cannot travel three weeks in a row.” Home is San Francisco, where Bates lives with his wife Jamie, a research scientist, and two young children, Toliver and Ryland, a boy and a girl (“We have the Waspiest names ever,” he says wryly). Bates is, however, a West Coast transplant: He grew up in Virginia, where his parents still live, and where singing in boy choirs in his church school was among his first formal musical experiences. He went on to New York as a student in the collaborative Juilliard-Columbia University program, studying composition with John Corigliano—who remains a friend—before continuing on to a Ph.D. at Berkeley, which brought him to the coast that remains his home. “Obviously, I’m fanatical about details,” Bates says: whether it’s a detail about the staging of one of his Kennedy Center concerts or a direction in one of his own scores. The care leads, as it is meant to do, to an experience that is smooth, fluid, and easy to apprehend—which has led, perhaps inevitably given his success, to some backlash from people who find his work too fluid, even glib. Anne Midgette is the classical-music critic of the Washington Post.